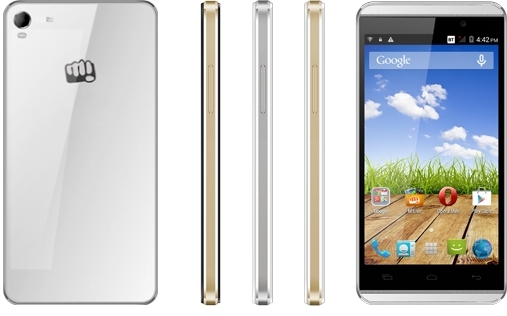 Indian smartphone company Micromax has released a new Android smartphone in the country. Dubbed as Micromax Canvas Fire A104, the phone has been priced at INR 6,999 and will be joining the recently launched Canvas Fire A093. As the pricing suggests, A104 is a budget Android phone and features a 4.5-inch FWVGA display, Android 4.4.2, 1.3GHz MediaTek MT6582M quad-core processor and 1900 mAh battery. The phone also packs 5MP rear camera with LED flash, 0.3MP front camera, 1GB of RAM, 4GB of internal storage and microSD card slot. In addition, the Canvas Fire comes with dual-SIM support, 3G, Wi-Fi, Bluetooth, GPS, and dual-front speakers. According to Micromax, the phone will be available in Black & Gold, White & Gold and White & Silver colour options. The company has also pre-loaded a number of application on the smartphone like M! Games, M! Insurance, M! Security, M! Live, MAd, Opera Mini, BookMyShow, Clean Master, Getit, Kingsoft Office and Reverie Smartpad.